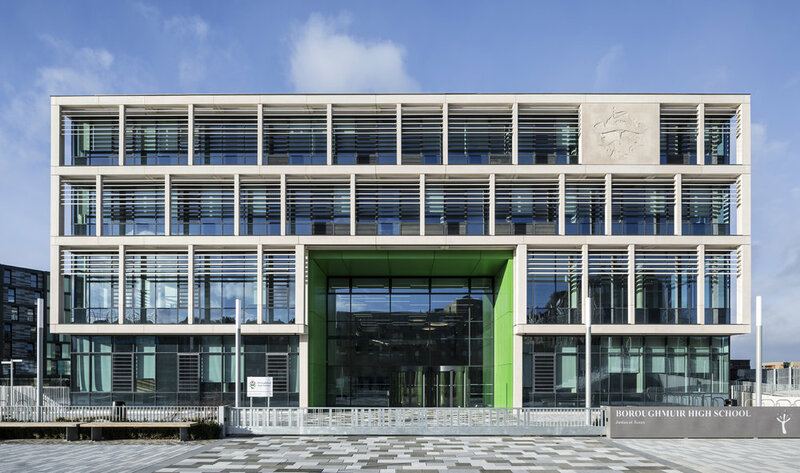 KSLD was appointed by the City of Edinburgh Council to prepare a lighting design strategy for the Boroughmuir High School at Edinburgh Quay, located at the heart of the Fountainbridge regeneration plan. Our concept comprises the internal and external lighting to the atrium, entrance hall, lower atrium, entrance and facade lighting. The school sits alongside the Union Canal and is an integral part of this vibrant new public realm. KSLD aimed to connect the exterior to the interior via a continuous, flowing linear pattern, creating abstract movement, and simulating the sources of natural light. In the school’s entrance hall, the rhythm of external louvres, vertically shading the interior, is repeated in perspective, travelling across the entrance ceiling. This rhythm transfers the sense of openness to the interior, and by return, conveys the eye from within the school to the waterway outside. 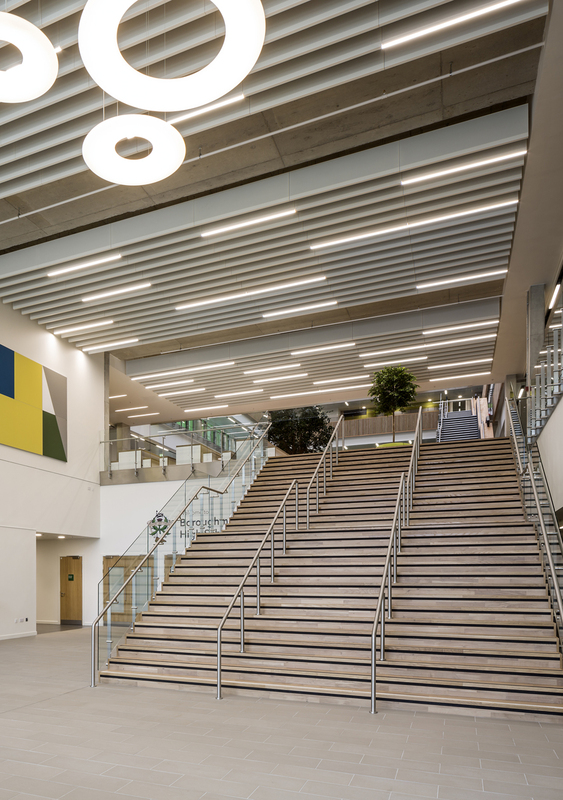 The vast, luminous atrium at the school’s core required continuous, linear elements to provide both lighting to the circulating corridors and walkways during the day and to reach into the heart of the building when daylight fades. High-level fluorescent flood lighting was specified at roof walkway level, filling the central roof space with light when required, supported by recessed linear profiles giving light at the inner edge of each floor level. The social heart of the building is illuminated, while circulation routes are decorated with a rhythmic variation to the uniform plan. White drop pendant luminaires also punctuate and soften break-out spaces and meeting places, and a triple ring suspended luminaire adds a sense of fun as you enter or leave. Artificial lighting levels were designed to be controllable, using a daylight harvesting lighting control system, in order to balance and enhance natural levels, with the potential for scene setting should the school need brighter or dimmer settings for functions or performances. This aspirational project has won the team many architectural awards, and has been a great success in regenerating this previously neglected part of Edinburgh. 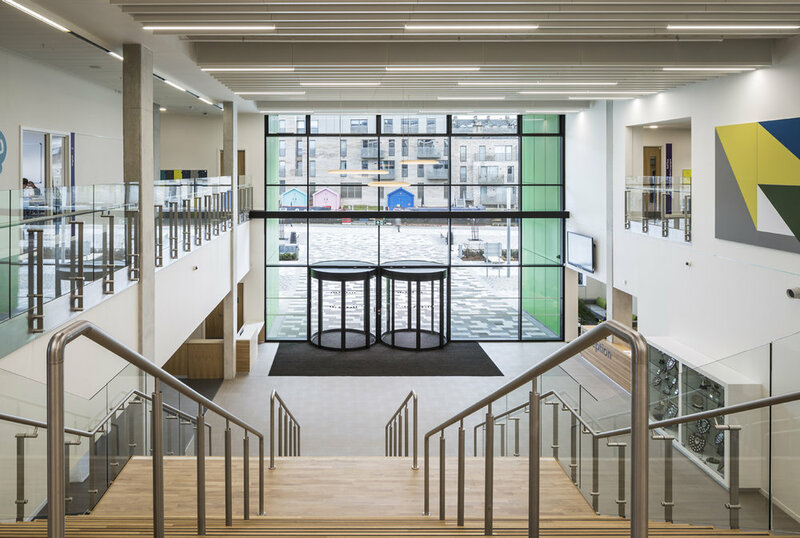 Maximum levels of natural daylight provide an exceptional environment for learning and teaching, while the vibrant lighting design, shared with the many people who enjoy Edinburgh Quay, has helped the whole area to breathe new life.